He, who sees, how can he say and why should he say? God gives witness for every such person [for the condition in which the slave remains]. Hazrat Muhammad Sal Allahu Alaihe Wa Aa-lehee Wa-sallam said that: "That person, who identified his Lord , his tongue lengthened [became fluent] thus"
I have got these Maratib from Hazrat Mustafa Sal Allahu Alaihe Wa Aa-lehee Wa-sallam . 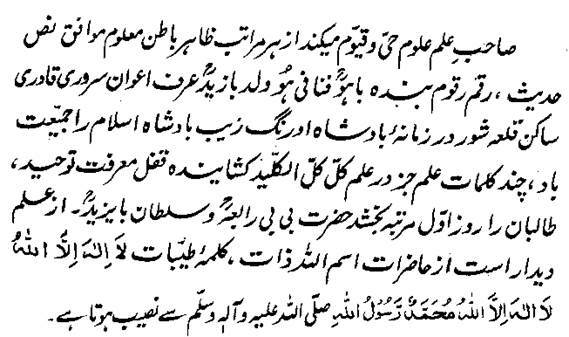 The Master of Ilm Uloom of the Hayyu Qayyum can find all the Maratib of the Outward and the Inward [from this book] in accordance with the Authentic Text and Hadis. Its author, slave Bahu Rahmatu-Allahe Ta-aala Alaihe Fanaa-Fi-Hu (Destroyed in Hu ), son of Bazaid Rahmatu-Allahe Ta-aala Alaihe , Surname A'waan, Sarwari-Qadiri, the resident of Qala Shor Kot in the reign of (the Mughal King) Aurangzeb [Alamgir], may Jamiyat be granted to the King of Islam with; describes some Words of the Ilm of Part (Ilm e Juzw) from the Ilm of Whole (Ilm e Kull) the Key of Everything (Kul ul Kaleed) because this [Part of the Whole] is the opener of the Lock of the Marifat of Tauheed by means of which, Maratib of Hazrat Bibi Rabia Rahmatu-Allahe Ta-aala Alaiha and Hazrat Bayazid [Bastami] Rahmatu-Allahe Ta-aala Alaihe are achieved by the Seekers in the very first day. This [Key] is the Ilm of Didaar which is destined through the Haziraat of the Name-Allah-the-Essence (Ism-e-Allah-Zaat) and the Kalimah-e-Tayyeb Laaa-Ilaaha Ill-Allahu Muhammad-ur-Rasoolu-Allah/there is none worthy of worship except Allah; Muhammad is the Prophet of Allah .